Run Box helps you to Open any application fastly instead using your mouse and browsing the application to open it.But after running many commands in Run dialog Box you will find a list of used commands.This may irritate us sometimes. There are many cleaner applications(Ccleaner) that will do this for you, but I will now explain how to do it manually. First let’s start with easier then we can try using regisrty hack. 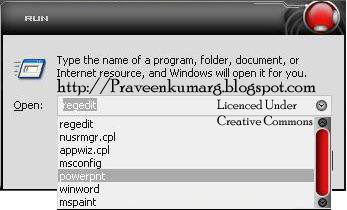 Right-click on the taskbar and choose Properties, then choose Start Menu. Select the “Classic Start menu” option. Now just click the Clear button to remove all of the recent documents and applications from the start menu. Once you’ve done that, hit Cancel and then Cancel again to make sure you don’t switch to the Classic Start menu. Note:This method will clear out everything... so if you just want to remove a single entry you need to use the registry hack method. Click Start–>Run–> Type regedit –>Press Enter. You’ll see all your recent commands on the right, and you can delete any of the keys that contain your commands. Restart your Pc(You will find the Run commands will be Cleared). Note:This will also work for Windows Vista’s Run dialog, although most people have switched to using the search box instead.